Gucci Style Threaded Bars & Screws with Thin Heads. A great deal! Over $150 value if purchased separately! Contains 2 each of 12 Threaded Lugs and 24 each Yellow & White Screws. Bars are 1.20mm diameter and lengths: 10, 11, 12, 13, 14, 15, 16, 17, 18, 19, 20 and 22mm. 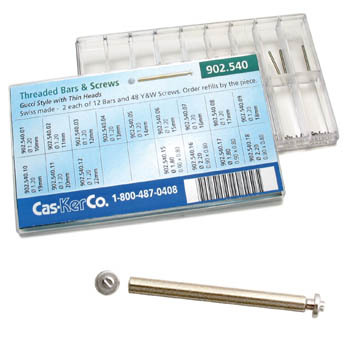 Screws are 0.90 x 0.80, diameters 1.80 and 2.20.